This work is the 'sunrise' one of a pair of 'sunrise/sunset' cabinet pictures commissioned by W.A. Brahe, Honorary Consul for Germany to the Colony of Victoria. 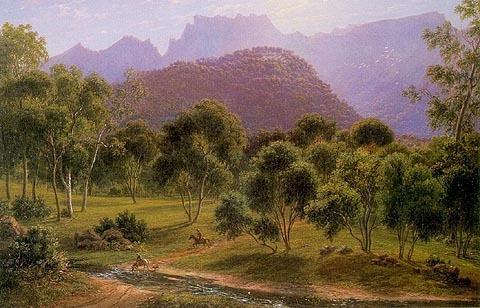 The companion 'sunset' work is 'The Gold Diggings at Ararat', formerly known as 'Mount Langi Gerang from Pleasant Creek', which is in the collection of the National Gallery of Victoria. Rose's Gap was so named after squatter Phillip D. Rose, who settled in the area at Rosebrook Station in 1843. This work was offered for sale through Deutscher Fine Art. A Selection of Nineteenth and Twentieth Century Australian Art. 24 May-9 June, 1989, Catalogue no. 6.